There appears to be some unusually cheap flights to the Galapagos Islands (GPS) from Toronto on American Airlines at the moment. Even from the closest country to the Galapagos Islands, which is Ecuador, the bottom price for flights to the Galapagos is usually around $500 roundtrip after taxes, so $775 from Toronto is a pretty crazy price. I've found flights around this price from March 2013 through to about the end of May 2013. The Galapagos Islands are of course a dream destination for many travelers out there. Hopefully this helps makes it a reality for some of you! - The Galapagos Islands are located on the Equator, about 907 km (600 miles) west of the mainland Ecuadorian coast. - Most of the islands are the tips of enormous volcanoes formed by slabs of the Earth's crust moving south east over a "hot spot"or stationary area where concentrated heat and magma are released. - The Galapagos penguin is the only tropical penguin in the world. toronto, yyz, flight deals, american airlines, south america, ecuador, galapagos island and gps. 11 Responses to "Toronto to the Galapagos Islands - $774 roundtrip after taxes - March through May"
Unfortunately, what it doesn't mention is that there are three separate flights involved, some of which are hours apart. The total travel time is somewhere near 20+ hours! 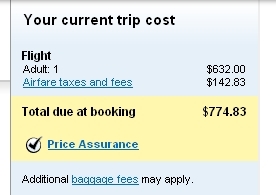 i checked and you can simply book a multicity flight for the same price on AA. this way you can spend a week in Equador and a week in galapagos. Thanks! This deal is amazing. I got my flights on Expedia for $750 return in March. Melissa: Did you try a multi-city search on Kayak? Jess, if you want non-stop flight yyz-gps, buy yourself a private jet. multicity itinerary on AA trying to add a stop in Quito (UIO) turns up an expensive and illogical routing to Guayaquil through Miami and New York! So get a stopover in GYE (nothing much of interest to travellers) and arrange Quito from there by plane or bus as a separate item. This is an amazing deal; until recently GPS had to be bought at a never discounted $400 or so from UIO or GYE, not combinable with international tickets. Boat transport is needed in Galapagos but there's usually something available on short notice if flexible re what boat and itinerary. Has someone found a good combo for a multi-city flight? I'm getting little over 1K flights stopping in GYE for eg for a wk. Awesome, please do that Olga, would love to see the pics!